This chapter is the printed matter of a series of lectures on shape optimization given in Udine (Italy) in June 2012. 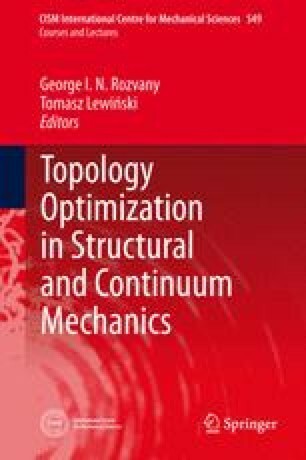 It is mainly focused on the optimal design problem in elasticity. It is well known, since the pioneer work of Tartar and Murat in the late 70’s, that this problem – as well as the scalar shape optimization problem in conductivity – is ill posed and does not always admit solutions. If the goal is to construct numerical methods to address this optimal design problem, this illposedness will lead to algorithms showing instabilities and erratic behaviours. Two ways are possible to slightly change the initial problem so that it may be solved in an efficient and reliable way by numerical methods. The first one consists in enlarging the set of admissible shapes and allow, as solutions, “generalized shapes” that may contain fine mixtures of the initial material and void. This process is called “relaxation” and the main mathematical tool involved is the homogenization theory. It leads to the so called “homogenization method for shape optimization”. It is described in Section 2, both from theoretical and numerical point of views, including practical issues necessary to write a numerical code. The second approach consists in restricting the set of admissible solutions. A few theorems prove the existence of solutions under further geometrical, topological or regularity constraints. The classical domain variation method is revisited using the level set representation, that may be seen as a constraint on the set of admissible solutions. The main tool is here the shape derivative. The level set algorithm is presented in Section 3. Of course this chapter is too short to develop new results and methods and present extensive proofs. Its goal is rather to give an overview on different parts of our work on this topics. Interested readers should check the references cited to have further details.